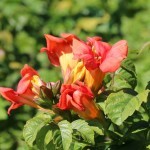 It is a dwarf flowering vine, the compact form making it great for growing in containers. The flame red flowers, with intense orange overtones, blooms from spring until frost. 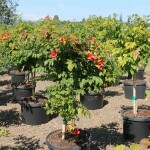 Easy to grow, attracts hummingbirds and butterflies. It is also known as Campsis x tagliabuana 'Takarazuka Fresa' (Plant Patent #23,917).